Partido Manggagawa (PM): On the signed EO on Endo: Will Congress stand stronger than the mightiest President this country ever had? On the signed EO on Endo: Will Congress stand stronger than the mightiest President this country ever had? The EO narrative is over. Sadly, we are in for another waiting game as the anti-endo ball was passed by the President to Congress for ultimate resolution. The workers’ struggle for security of tenure, therefore, is far from over. Tuloy ang laban! A bigger question, consequently, is bothering our workers now: Will Congress, which is known for greasy political horse-tradings, stand stronger than the mightiest President this country ever had? Yes, we were truly dismayed and frustrated with the Executive Order (EO) on endo signed by President Duterte yesterday. First, it was an EO that no one in the labor sector was able to read. Second, none of the most important povisions demanded by labor - which is the reinstatement of direct-hiring and regularization as the norm in employment relations - was adopted in the signed document. 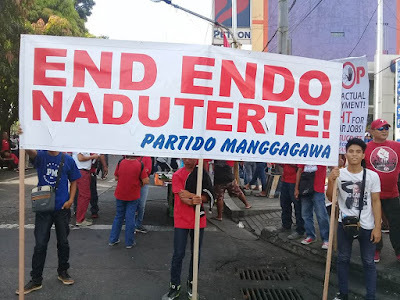 In short, after more than two years of protest actions, negotiations and labor groups’ dutiful drafting of five drafts of an EO, it was big business and their captured officials in DTI and DOLE in the end that won the heart of the President. The die is cast here and in this episode of class battle it is the side of capital that gained momentum with their effective capture of the Executive, including the President. Upon signing of the EO, President Duterte admitted that his order is limited only to what is provided under the Labor Code. What he never explained is the fact that such limitation is surmountable by the the Code’s the same grant of executive powers to the President and the Labor Secretary (Article 106) to prohibit contracting and sub-contracting. The five drafts submitted to him by labor groups have in fact addressed that concern by providing exemptions to allowable forms of contractualization upon consultations with the tripartite council. The President said he cannot be a legislator to correct the Labor Code’s constraints. That, to us, sounded so legalese and diplomatic for a President known for unorthodox political brinkmanship. “Sinagad ko na ito,” Duterte declared after signing the EO. At nasagad nga sa kasiyahan ang ECOP.